Today I’m happy to have Scott Voelker on the show. Scott has been an entrepreneur for a quite a while now. He runs a successful portrait studio. And he also teaches course on online photography. But the reason I brought him on the show is to talk about his Amazon success. Scott runs the popular podcast The Amazing Seller and the website of the same name. And his claim to fame is that he went from 0 to 47K in 90 days selling on Amazon. Today we’re going to to break down his process of finding products to sell on Amazon, and his process for making money on the platform. Enjoy! Where Scott sources his products from. Steve: You are listening to the My Wife Quit her Job Podcast. And if you are new here, it’s a show where I bring in successful bootstrapped business owners to teach us what strategies are working and what strategies are not. Now I don’t bring on these famous entrepreneurs simply to celebrate their success, instead I have them take us back to the very beginning and delve deeply into the exact strategies they used early on to gain traction for their businesses. Now if you enjoy this podcast please leave me a review on iTunes and if you want to learn how to start your own online business be sure to sign up for my free six-day mini course, where I show you how my wife and I managed to make over 100k in profit in our first year of business. Go to www.mywifequitherjob.com, sign up right on the front page, and I’ll send you the free mini course right away via email. Now before we begin I want to thank HostGator for sponsoring the show. HostGator is an incredible webhost that I highly recommend. And in fact did you know that mywifequitherjob.com was hosted on HostGator in the very beginning? They offer 24/7 live support, via chat, phone and email, one click WordPress install, so you can literally install word press blog in a matter of minutes. They have an easy to use website builder, design services, marketing services. And the best part is I’m offering a 30% discount for all podcast listeners. So please go to HostGator.com/mywifequit to redeem the discount. Once again that’s HostGator.com/mywifequit. There’s also an incredible theme store where you can choose from a variety of attractive store designs, so you don’t really need to hire a designer. And everything from design to payment processing is all built-in, and all you just have to populate it with your own products. So you can literally start your own online store in a matter of hours. Simply go to bigcommerce.com/mywifequitherjob, sign up and you will instantly receive one month free. Once again the URL is bigcommerce.com/mywifequitherjob, now onto the show. Steve: Welcome to the My Wife Quit Her Job Podcast. Today I’m happy to have Scott Voelker on the show. Now Scott has been an entrepreneur for quite a while now, and he actually runs a successful portrait studio with his wife, and he also teaches many courses on online photography. But the reason that I actually wanted him on the show today is to talk about his Amazon success. 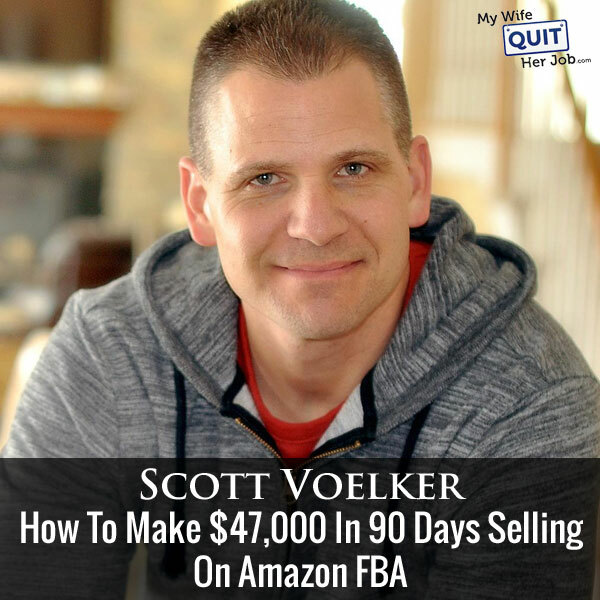 Scott runs the popular podcast, The Amazing Seller and the website with the same name, and his claim to fame is that he went from zero to 47k in 90 days selling on Amazon. So today what we are going to do is we are going to break down his process of finding products to sell on Amazon, and his process for just making money on the platform. With that, welcome to the show Scott. How are you doing today man? Scott: I’m doing great man. Thanks a lot for having me. I’m a big fun of your show too. So yeah, I’m really, really excited to be here and hopefully add some value to your audience. Steve: Awesome yeah, I’m sure you will be able to do that. Let’s start off with some of the background stuff for a start. How did you go from selling photography courses in this portrait studio to actually doing physical products on Amazon? Scott: Yeah, sure. I will give you the quick version on that. Just a little bit of a correction there, we are not currently running a photography studio. We started with that, about eight years we did that full time, my wife and I. And the same idea, I was working full time as a contractor, I was building homes and doing remodels and stuff. I was just never home with my kids, I had two little kids at the time. We just wanted to do something else. We started thinking about how we could do this online thing, found people selling things online. This is going back like, oh gosh, seven years ago, and then found people are selling information online. So I said you know what, let me give it a shot. I’ll just teach people how we got started. We built a six figure local brick and motor business, and hey I’m sure there’s other people out there that could use the help. Sure enough built a little list, and launched my first product and within that first product– I think my first launch which blew me away was like 12 grand in like a day and a half. So it was like– now is going back six and a half years ago. Steve: This your info product. Scott: Yeah that was the info product from just teaching what I– I didn’t figure myself as an expert, just kind of retracing the steps of what we did as a husband and wife team building a photography studio. So it kind of just got me involved into this type of online space, but I’ve always been an entrepreneur and again that’s what I mean. We built our business and then I kind of turned around and taught people how I did the business. And I still run– we have a new portrait base is what our website is called, and it’s really just helpful lessons for newbies that are looking to do more or less like children’s portrait photography. And now we really teach a lot about—I teach a lot more about the editing with Photoshop and stuff like that. I’m still involved in that. That still runs today. And then from there just looking to kind of expand ourselves. Obviously you are always looking for new revenue streams as being an entrepreneur; you don’t want to rely on one source. So I’ve always been dabbling in all different things as an entrepreneur, see the opportunities and stuff. And Amazon was the closest thing to a digital product because the FBA model, I really loved because I didn’t have to fill it. So with my background in marketing and internet space and everything I figured you know what, I can figure out all the moving pieces. Let’s just kind of give it a shot and see what happens. And we did and here we are going on– just over eight months now, and yeah it’s just been just a crazy, crazy ride. Steve: Just curious, in those eight months, you mentioned that you hit 47K in the first 90 days which is three months. Where are you at now? Scott: I don’t have the exact number for you, but I can tell you that I’m averaging a month about $35,000 in revenue. Steve: Nice. And what are your margins on that revenue? Scott: Right around the 40% mark. Steve: Okay cool. That’s sounds really good. Scott: I’m looking to get that to about 50, we can talk about the strategy too, but usually in the beginning, you are a little bit lower just because you want to get the ball rolling and the momentum started, and slowly start increasing. And in the summer a lot of times your sales are going to be lower in the online space which you may or may not experience as well. But yeah, I’m looking to– those are low margins I think. I think and I’m hoping to get them around 50 to 52%. Steve: So in generating that 30K or so a month, how many products is that on Amazon that you are selling? Scott: I started with one product and with that one product; I was still able to get that tool right around 25,000 to 27,000 with just one product. And then since I’ve added right now, if you count just because there’s variations on products as well, which I know you are familiar with that. But I mean, so if you counted the variations of the one product, you are talking that’s seven products. Steve: Okay, and they are all related meaning like different colors and stuff or? Scott: Yeah, like sizes, type of thing. Steve: Okay, and are these products anything to do with photography at all? Steve: Okay, so completely different niche than you’ve kind of dealt with in the past. Scott: And I got to be honest, that was part of my thing. I wanted to not rely on that. It was two reasons I did that. I wanted to prove to myself that I could enter into another niche, and I could also not have to rely and depend on that one business model. I also felt like the photographers, no offence to photographers that are listening, but they are just—they don’t spend a lot of money on certain things other than cameras. They are really kind of protective of their money which I was too, don’t get me wrong, but it’s just a different mindset. So I wanted to go after where there was already buyers, and I felt like Amazon was just like a river of money, because there’s people going there for one reason. They are not going there to search for how to take better pictures; they were looking on how to buy a lens. So I very easily could have went down that road, and I thought about it. I got to be honest because it wouldn’t have been very easy because I have an email list, and I could just start promoting products to my email list and kind of ramp that up, but I didn’t do that. I went down a different road, and it’s proven to be pretty good and it’s also proved to me that I can kind of pivot and go to another direction and do that. Also I didn’t want to be the fore front of it really. I wanted to kind of do a business that could work without me being involved in it. I could kind of hire it out if I want to, like there are certain things that I will eventually be hiring out, tasks that I do and really I’ll just kind of be like I guess the lender in a sense, and then the business will kind of run itself. That’s really my goal with this business. That’s something that I’m looking to do. It’s not that way right now, but that’s what I’m definitely looking for. Steve: So in terms of like finding the product then, did you actually choose something that you were kind of interested or you knew a lot about, or did you just kind of go off and pick something pretty random? Scott: Well, at first I just started looking at products. I just started to kind of go through the whole thing like what could I sell, what could I think that would sell well? And I will tell what I was looking into which I didn’t go down this road is, I was looking at baby products. I was looking at baby products for a couple of different reasons, because I knew that there was a lot of people have babies, and I knew that there was huge market for it. But then in the end I started asking myself, do I really want to be– if I eventually want to do a blog about this, do I want to be just researching that information and doing– I mean I have kids, I have three kids. I have a seven year old daughter, I’ve got a let’s say a 17-year old son, just turned 17 and a 20-year old daughter. So I’ve got them all over the place. But they are not in that stage. I know people that have babies and I could have did that, but it just wasn’t going to be as easy for me to even just even take pictures. If I wanted to take pictures of my product with a baby, it was going to be harder to find that. So that was another thing. I just felt like, it’s just not aligned with me personally, so I wanted to get into something that’s more or less I was going to use, but also I was going to I guess eventually also always be kind of involved in this market. So that’s kind of why I went down the path I did. Steve: Okay, so given that, I know like the Amazon– the people who sell on Amazon like to be secretive about their products, because of the intense completion. So I guess we won’t go into detail about your exact products, but what we can talk about is some of the criteria that you used actually to select the product that you are going to sell, right? Steve: Okay, so what did you– so let’s go back to that just very first product first off, what was your research process like? Scott: The research process and again, it’s a stuff that I tell anyone starting right now. The very first thing was just like, I do like a daily touch list. So everything that I touched, I would just write down like little things. It could be the cake cup, or you are having coffee, a little stainless cake cup thing. It could have been, I’m looking at my stuff right now in front me, like a USB code, a mouse, a mouse pad, any of that. Anything that I touched on a daily basis I would write that stuff down just to get the ideas flowing, and kind of flushing out all the ideas that could be a potential product. Now that I’ve been through it, I kind of look at things all differently, like anything. I’m listening to conversations, all of that stuff. But really just I guess looking at my own interest and stuff, and then from there knowing that I didn’t want to go into an oversized product. I didn’t want to sell something that was going to be over the certain guidelines that Amazon requires as over size for a few different reasons. Number one it was going to cost me more for inventory. It was going to cost more to get it shipped, and it was going to limit me how many I can have in stock in Amazon at one time. So I believe that their starting point for over size is like only 500 units that you can have it stock. Scott: You can get that usually lifted as long as you start to show you have more volume, but it’s just another whoop to jump through. And then I was going to have to go and have stuff shipped by boat, by sea. It was going to take longer, more customs, all of that stuff. So I have certain criteria which I can share with your audience that I look at right now and I also recommend which is really simple. It’s something that is light weight, something that can usually fit in the shoe box, under two pounds. And usually the length, I believe that the length, the longest point is like 18 inches, but it also goes by circumference and all that stuff. Anyone can kind of Google like you know Amazon, or you can even put something that even showing on it. It’s right on the Amazon website for criteria. It’s real basic. But just something that’s not oversize. So that’s the thing. My price point, I like to be between $19 and like $45. Now I tell people that and they are like, “Well, Scott I found a product that’s $16.99, is that still good?” It’s still good if the margins are good, you know what I mean. So it’s just a guideline. I look for something between $19 and $45. I definitely make sure that I can get my margins at around 45 to 55 percent even if I can’t start there; I want to know that I can at least get there. So it’s like kind of a premium product. Steve: Are you talking about post fees or pre fees. Scott: Post. Like all said and done, I want to be able to walk away with– and I always, I use this– I’ve got like this ten by ten by 1 strategy that I call, it’s like 10 units a day sold by ten dollars profit each and then one product. That’s 100 bucks a day. That’s kind of my simple little formula for people. It’s like if you can just do that, it’s going to be easier than try to find those products that are selling 50 to 100 units a day. It’s a little bit like the low hanging fruit. But that’s kind of how I look at it. After FBA fees and all that stuff, and your shipping and all of that everything, you are left with ten dollars in your pocket. That’s what I like to chew for. Steve: That means that when you are sourcing the product, you want margins somewhere in the order of 70% it sounds like? Scott: Yeah roughly, roughly. Yeah, I mean because I’ve been doing this a little while now. So it’s like for example, if you sell something for $20 on Amazon, usually the FBA fees are going to be right around $5.25 cents. $5.50 somewhere there and that’s for everything ship, that’s from picking, packing, shipping, everything. And then if I can get a product for me, if I can get it for like $4.50 well I’m right in that realm of where I want to be. So that’s kind of like my rough numbers. But then a lot of people will kind of start low, like they’ll find a product that is $14.99 and try to get the margins to work. It’s okay as long as you think that you can still get your margin, but it’s going to be harder to do that. So anyway that’s the pricing that I go with, that I definitely look for. I definitely look for something that I know that I can ship via air. I don’t want to have to ship things by boat or sea, and a lot of times that has to do with your size limitations and it just cuts down on any other hoops and things you have to jump through. So I don’t want to have to go through freight forward right now. I want to be able to go right straight from their loading dock to my doorstep. Steve: Interesting, so that’s implies that your order sizes are generally under a couple of hundred pounds? Is that accurate? Scott: No that’s not accurate at all. I literally– I just had an order shipped to me, about 2,000 units. And those 2,000 units each box, let’s say there were 20 boxes and each box you are talking roughly probably like 35 pounds. Steve: Okay, wow so you did all that by air? Scott: All that by air and here’s the cool thing. Literally three days, DHL air. Scott: Now people are going to be like, “Well, Scott I’m paying, $3 for the product and they are charging me two bucks to ship it.” I don’t care because at this point, I just want my margins to be where my margins are going to be. That’s a cost I could reduce down the line. But right now it’s a matter of speed of implementation. Get it. Get it done, get it in there. Let’s see if it’s going to work. If it’s going to work, then we can start reducing those costs. A lot of people will try to get all the cost down at the beginning, and then it takes so much longer. It’s going to take you instead of it taking you– well it takes using 25 or 30 days for them to manufacturer, and if you go by boat, it’s going to take you at least three weeks in general. And then to get it into FBA, you are talking at a time almost 60 days when I can get it here in like 35 days in Amazon. It’s like I’m 20 days ahead of you. Steve: Yeah, it just takes a little bit more planning I guess and more upfront money if you want to go by boat. Steve: Hey, just curious on your price points, I’m just curious, did you choose somewhat lower price points so you that could actually give stuff away for reviews without taking a huge loss, or what was the reasoning and rationale for–? Scott: Yeah, I think cost has a lot to do with it because again like you just said, I mean, we can talk about that too once we go further in to this. But yeah I mean, if you have something that cost let’s say five bucks, you know, and you want to order a 1,000 units, that’s five grand. You know what I mean, that’s a good chunk of money for people just starting. It’s a lot harder to do that than just start blogging and creating a niche site and trying to create information products, right? So it’s definitely harder. So in the beginning, you do want to have enough inventory to what you can give away. Let’s just say 100 units. And I say give away. You want to start giving the review process in place, so you are going to basically give those away for almost free. Let’s say you give them away for a $1.95, but you still have to pay the FBA fees on top of that, right? So really, if you are giving away 100 units, that’s $500 and then you’ve got FBA fees with another 500 bucks, there’s a $1000 that you are giving away without even making a penny. But now if you had a product that was, your cost $20, well, you do the math, I mean we just– it’s a little out of hand there at the beginning. So it’s going to make it harder to really ramp things up. So I do that, because it makes it easier, and also it’s just easier on shipping and all of the numbers just seem to work better. Now I do have someone that actually followed my podcast and everything and went through everything, and he was actually in the process before he even started listening and he started with an oversize product. If anyone is listening and they want less competition, go with an oversize product. It’s that simple because you will have less competition. What he did is he went on AliExpress and he bought one unit. He had it shipped because on AliExpress you can do one unit, and it’s going to be more expensive, but he wanted to just test the market. He had it shipped, he sold it. He doubled his money. He bought four more, had them shipped, did the same thing, very slow process, but now he’s ordering pallets of about 140 by boat. So he just scaled himself up, but he couldn’t give away units to get his reviews, but he was still able to do it because he had a unique product that he didn’t really have to do really a lot of heavily promoting on anyway. I think he had like one or two reviews on it from family and friends, and he was able to still sell out every time that he got a new batch in. Steve: Okay, that’s a great story. So let’s continue down the lines of finding the products. So you covered your price points, you covered your interests, what are some of the other things that you do? Scott: So as far as looking at the numbers, we want a prove. I think the beautiful thing with going on Amazon is we know that there’s buyers there. We absolutely know that. And we also know that they are giving us numbers by looking at the best seller rank or the BSR as everyone kind of knows it does, and that’s kind of like a ranking that they give them. Every category is different, so if you’re looking in the home and kitchen, or if you’re looking in let’s just say you know lawn and garden, they’re totally different. Like in a home and kitchen you might have a 10,000 BSR and you’re still selling 15 or 20 a day, but if you’re selling in lawn and garden and you’ve got 10 or 1000 that might only be, gosh one a day. Maybe four a day I don’t know the exact number, but I am just saying each category has their different velocity of sales in the amount of sales. Because of that you kind of have to have a guide to go by, so I just kind of knew that if I could find something that was between like 1000 and 5000 somewhere in that in the BSR no matter what category I went into, then I pretty much knew that they were selling at the time. I was looking at 20 sales a day; I’ve since made that to now where I am good with 10 units a day. Scott: Because I just know that the more products you have in there that are related that 10 per day that you shoot for initially will probably go to either 15 or 20 a day, just by cross promoting each other inside of that product. I look for that you know as far as the BSR, so I will look at that, I’ll create a spread sheet and go ahead and start just looking at the numbers of the BSRs and I’ll be tracking them, and there’s a free tool you may already know this you probably do it’s called kemokemokemo.com. If you go to that it will give you the history of the BSR, it will give you the history of the pricings. You just take the acing of that particular listing, punch in kemokemokemo and it gives you all of this data right at your finger tips, which is beautiful because now you can see the growth of it, you can see the if they’ve run promotions, because you see spikes in there’s and you can see their sales and kind of their sales you can see their pricing which kind of lets you know what their sales were and kind of what they’ve done, and kind of how steady it’s been. I kind of looked at all of those things I looked at the reviews and I guess I should point out like if I am looking at and I always use garlic press as one source. Let’s just say we’re looking at a stainless steel garlic press, I would go to Amazon, I would type that in and I would look at the top 10 listings okay, and there 16 that usually come up on your home page depending on what browser, or what if you’re looking at a phone or whatever, but usually 16 results come up. I’ll look at the top 10 and I’ll start to look at those numbers, I’ll start to look at their reviews I like to see reviews between 500 and zero, somewhere in that range. Scott: If I did see the number one spot had 1000 reviews, but then the second one had 500 and the third one had 300 and so on, and it kind of kept going down, then I would still be okay because I wouldn’t necessarily think that I had to beat the number one, I just want to find myself somewhere in you know the top you know whatever 10 somewhere. Then to also– another really key point, here’s a mistake I made on my second product which I say is a failure, and it’s still selling five a day, and it’s not even really in the season yet for this particular product, but the depth of the market. And when you looking at products you want to make sure that the BSR is going to be steady throughout those 10 or at least those seven because then it shows you that you don’t have to be number one or number to at least get your 10 or 20 sales a day. Does that make sense? Steve: Yeah absolutely, so if you see like the top spot like has 1000 and the rest of the guys don’t have any reviews then, that’s a bad idea right? Steve: Can we go into more depth on that, so what an example of a bad listing outside of like bad photography for example? Scott: Outside of that I will say like their title doesn’t have really any key words in it, it’s really just very-very vague and basic or maybe it’s a brand name that they’re putting in there. Like they’re a private labeler, but they’re putting in like their brand name which I think is a big mistake because no one really cares about your brand, they care about what it is. Stainless steel garlic press would be the one that I would want in there as my title, and then you could probably put you know other ones in there. Depending on what category you are in, you get allowed up to 100 characters in some categories up to 200 characters. Scott: I know recently I think you had a guest on Karen. Scott: Passing, I just actually interviewed her for my show, she won’t be on for another couple of weeks, but she did a really-really good job on your show, and she and so if anyone is listening definitely go back and listen to that show, because she did a really good job of breaking down a listing, and what makes a really good listing. It’s, to me it’s really simple, its images, its title, its bullets, its description. All of those elements inside of a listing makes it optimized. If you’re looking at a listing and you see number one the images aren’t good, that’s the first thing. Second thing the title is not optimized that’s the other thing I would look at. The bullets, if they’ve got like one bullet flow in there, right? I know that I could fix that. Then I’ll also look at the description and see if it’s just like a sentence or two, and I know that I can totally do better than that. A couple of other things that I look at is like for example if they have other products, but they’re not using that promotional tab inside of their listing. Sometimes if you scroll down you’ll see in the promotions thing it says that you know maybe like buy one you know get $5 off your next or something, or maybe this other product that you have. You’re able to run these external promotions that feed inside of your own listing. That’s why I like to tell people when you’re starting out definitely pick a product that you think you can build a small product line around, because you want to have one customer that can buy four of your other products. Scott: Yeah and so by feeding in that promotion it basically allows you to cross promote your own products without even relying on Amazon to do the thing at the bottom there that it says you know frequently bought together. That’s Amazon’s thing that they do which they do it brilliantly, but you’re also able to also feed in. If you want to say if you buy this one product and then you can say the other product over here you can get for you know $5 off, or something or here you know buy two of this one product. Maybe you have a product that you can buy and people want to buy more than one. Buy three and get you know $5 off or 10% off or whatever. That will populate inside of your listing and then you can say the same thing for your second listing. Let’s say you have another listing with another product, you can do the same thing feeding back into that other one, so now you’re really piggy backing on both of those products. Steve: Interesting so do you, are you doing that with all of your products right now? Scott: Yeah I am doing it with let’s see I am doing it with two products, but one of them has three variations, so you know I guess you would look at it like technically like almost like five listings kind of like going back and forth, which we can talk about variations too in a minute because I really-really, I am really loving them, and I am loving bundles, because it just allows you to increase the cart of that person with your own products, but it also gives you the ability to reach people on different price points. Scott: We can dive into that, I don’t know if you want to that now, or you want to wait till we get down that road? Steve: Let’s see actually I want to talk a little bit about sourcing a little bit, because it sounds like your sourcing strategy is completely different from mine. We do everything by boat. When you’re approaching vendors do you use Alibaba, or which services do you use to actually find the vendors? Scott: Agents. No and basically a lot of people will come to me and go Scott how do I find you know a sourcing agent? And I am like well number one you got to understand that on Alibaba that’s pretty much what they are, and if you ask them they’ll pretty much come out and tell you that, but they won’t tell you that because they want you to know that they are working for that company. Now some of them are working directly for that company, but as like a sales man, really it’s kind of what they are. What I’ve found is that by going through the process of kind of like screening these people, okay, and by telling them exactly what you want and what you need for your business, then you’re almost like putting them through an interview process. That’s kind of what I did, and since I’ve done that I really don’t have to go to Alibaba anymore to find products in this line, I just go to my agent and say, hey I am looking to roll out this new product, do you offer this or can you find it for me? Whether they can do it or not they are going to go ahead and go through their channels to find it. They may charge me a little bit more for that you know 10 cents a unit or something, and then they’re going to do the work for me, so that’s really how I’ve done it so right now I don’t necessarily go to Alibaba to find my next product. I really go through my agent now and I ask her you know if she can find it for me and she has. The other– here’s a little tip for people, once you do find that one person that you can trust, and I would suggest also having a backup, I would always suggest that so that way therefore if one didn’t work out, the other one you can kind of piggy back off of, or you could also kind of use as leverage. You can also say to them, hey could you send me over a catalogue and let me see some of your other things that you produce, and now you might be able to add stuff right through that catalogue that you didn’t even know was there, because it might not be listed on Alibaba. Steve: That’s interesting. Usually the people I deal with are very hesitant to send out a catalogue. Scott: No, I’ve got numerous ones from any of my– and well any of my, I’ve only had like three. Scott: I mean so out of all those I have asked all three of them from separate companies and they sent me one right over. Not in the mail, they’ll sent me a digital catalogue, and I go through it and I kind of see, and I’ll get ideas and go well, maybe I could add that to it or maybe I could take two of these products and put them together and make like kit or something. So yeah, it’s a good way to get ideas, and if anyone has the opportunity to go to the Canton fair, I would definitely do that. I had not done that, I’ve got a really good friend of mine who just came back from spending a month there. And because I have met this gentleman and he has become a friend of mine he brought me back like, oh gosh 200 catalogues sent them to me. So I have agents that are literally not on Alibaba that I can really reach out to and say, hey can we do business. So that would be another way if you want to go down that path. But in the beginning Alibaba is a great way just to kind of to get your feet wet, and also I think to screen agents that you could possibly have as your own. Steve: Hey, everyone I just want to take a quick moment to thank Famebit.com for being a sponsor of the show. Now Famebit is the number market place for YouTube influencer marketing with over 15,000 You Tubers looking to promote brands from beauty, tech, gaming pets and more. Now videos start as low as $50, and it’s completely free to post a campaign and receive proposals from You Tubers. Now if you’ve listened to my podcast before, one of my guest Emmanuel Eleyae used Famebit.com to make over $65,000 in four months with YouTube influencer marketing. And the best part is if you use coupon code mywifequit@famebit.com, you will automatically get $10 off. So go to Famebit.com right now, and get famous You Tubers to promote your products, now back to the show. So these items that are in these catalogues are they like stock items, or do they produce them? So just to get an idea what are some of the minimal requirements for those catalogue items? Scott: Oh gosh, I have done I mean even just in small runs 100, 250 — yeah, I mean not that much. And a lot of people will go on Alibaba, they’ll get scared they’ll see 3000 minimum order. But if you ask a lot of times they’ll do with 250, they’ll do 500 or whatever. You just got to — and I have kind of written an email that I kind of give it out as to my email list, but it’s basically just the question that I have asked that I went back and forth, and kind of like condensed them. But a lot of times its just like we are looking to add this product to our business, we want to be able to make sure that your company is going to be able to fulfill everything, I know your minimum is 3000, would you be willing to do a test run of 500. And I haven’t heard really anybody say no, so you just ask. Steve: Yeah, well, once you ask for their bank accounts so you can wire the money or what not, they usually don’t complain, because at least in my experience. Scott: And you know what you bring up a good point there, because you just mentioned wiring money and I haven’t done that, I got to be honest. What I have done is I have used their escrow service within Alibaba. But a lot of people are nervous about wire transfers, and I don’t blame them there’s been a lot of stuff out there that has happened. Maybe you could help me and share with your audience too, like what do you do that’s going to help you protect you from doing a wire transfer other than trusting that agent? Steve: I have never been ripped off, and we’ve worked with a bunch of vendors over the years. I mean you won’t get like I’ll write we are ripped off, they might send you stuff that isn’t as high quality, but if you’ve done your due diligence and done samples and stuff, it’s generally okay. But I have no comments about wiring money at all. Scott: Okay, well, that’s great to hear, because like I said I mean just recently in my Facebook group, I just had someone that they had a bait to do and they think they lost like — they took them for like 2500 bucks. Scott: Yes, so I mean I don’t hear of it often, but I do hear of it happening, so I guess that’s why it happens. So I mean, but let me just understand this, so if you did wire them 2500, and they didn’t deliver the product you are pretty much out that money, right? Steve: You are pretty much out that money, but usually we don’t do that unless we’ve had a conversation with them like voice, or we actually even met them in person. And we find a lot of our vendors from the Canton fair, and so if they are there they are pretty legit, they are not going to — yes, so I guess — if I just found some random person in Alibaba, didn’t do any due diligence, I probably would be a little hesitant to wire the money. Steve: In which case — yeah, if they took my money fine. Scott: Okay, got you yeah, I guess that’s definitely something that I’ll definitely be playing with in the future, because I’m sure that I will always get someone that will do escrow. But right now I have got an escrow set up within Alibaba that I have been using. Steve: Yeah, that’s perfectly fine too. Scott: I love that because I mean literally they send the product, and or I pay 30% down to get the product started, and then that money doesn’t get released even until the product is here and I hit confirm. So literally that money is held in escrow until I’m satisfied. It costs a little bit more, and they actually approached me and ask me if would start wiring and I said no, just because I want to see if I could still get them to escrow and they just said that there was a fee that they were paying, so I said what if I pay the fee for you? And it was only like 250 bucks, and I’m like that’s insurance for me. So I have done it, but I’m actually kind of leaning out towards that — I may just go ahead and start wiring because it will save me 250. But also I trust them, I have done business with them now for well going on just about eight months and I haven’t been burnt. So I think it might be time. Scott: That’s good to know, great. Steve: Yeah, so — see where did we stop off? Okay, so the first approach, so you are always looking at the order like a couple of hundred units? Scott: Yeah, well, actually if I’m starting out yeah, I would say I try — if I’m starting out I’m happy with the sample, I usually would start with 500. Scott: That gives me 100 to do as a giveaway as a giveaway really like a dollar ninety five. And then from there I have got 400 units to kind of start pushing pay per click and stuff like that. And then once I see that it’s starting to take, then I can go ahead and do a reorder or I might be doing a reorder when I get it, it just depends. But yeah, I mean like on this fourth product that I launched I basically did that and little bit different when you got variations involved, because now you’ve got like — even though it’s a one product if you’ve got variations you are talking maybe 100 of each variation, and you could be 500 and just have a 100 each. Scott: So it makes it a little bit harder, that’s why anyone starting I always tell people, I would start with one product, and if you wanted to go down that route where you had like different skews for that same product maybe do some bundles, maybe do like a one pack, a three pack and a five pack. Steve: Okay you know that makes total sense, so how much would you recommend that someone needs to start doing this? Scott: Well, my — one gentleman that I interviewed [inaudible 00:37:04] he actually started with like 150 bucks. So me personally I would like to say like probably between $2,000 and $3,000. That would be like to me like a good amount, but yet not enough that’s going to really allow you to really ramp up first, but it’s going to get you ramped up faster than just starting with a couple of 100 bucks. Steve: That’s a good wife. Scott: Yeah, she actually pushed me to do it, so wended up spending it, and now I can thank her for that because we are definitely doing pretty well with it. Steve: It’s like liquidation yeah. Scott: Yeah, you can literally go there and you can buy one unit, ten units and literally everything is done, you don’t have to worry about wiring money, it’s like escrow in a sense. And you basically get your product in either a few days or a few weeks depending on what kind of shipping you are taking. But usually you can do DHL three day express on that. So literally you can have a product idea, grab that, have it up in a couple of weeks. Steve: Yeah, so okay, so we got our 500 units, what’s the process to get them on Amazon and what’s your kind of process for introducing a new item? Scott: Yeah, sure the process is when I get my sample I’m happy, I order the 500 units I’m not done, now I’m going to be building the listing. I’m going to create the listing; I’m going to take my samples, if they are good samples that I can actually take photos of I’ll try to get my base photos done, at least to get the listing created. And then I’ll just build up a listing to be kind of like a shell so it’s ready and fulfilled by Amazon. And when it’s fulfilled by Amazon it won’t go live until you actually have inventory in there. Scott: Yeah, I built– I mean my first thing was I just built a list of — I just wrote down a list of all of my friends and family that I could think of. That I could either hand a product to, or I could have them go and I give them a coupon code, and they can get it for a dollar or a dollar and 95. And I just wanted– and I want people to — because I’m sure you’ll get this and I have gotten this before, people are like yeah, but doesn’t Amazon frown upon family and friends. They don’t frown upon it, they just — they want it to be an honest review, but they might not give you a verified review if they didn’t go through the process. Or they won’t give you one if they didn’t go through, and buy it through a coupon code. But here is the thing, if you have a family member or a friend that you’ve done business with in the past, say business, if you’ve sent them a gift, then you are connected. And when that’s the case now that person can’t leave you a review, they can try, but it’s not going to take, it’s not going to stick, you are not going to get banned because someone tried to leave a review which was your family member, they are just not going to allow you to do it. So I just want to be clear on that, so really my first my very first thing that I want to do is get like five to ten reviews. That’s my first thing, and I don’t care if they are verified, I don’t care if they are unverified, I just want the base review, so when you look at my listing, you see stars, right? I don’t want to just say be the first to rate this product. So it’s really just social proof, that’s all I want it for. And then the minute that that is there, that’s ready I can turn on Amazon pay per click, which I think is the most underutilized traffic that anyone is — that anyone has access to that should be using. So that’s — I would turn that on like immediately, and I would turn on an auto campaign and kind of like my strategy here is I turn on the auto campaign in Amazon pay per click, and I’ll let that run for seven days. And what that does is that that will then allow me to pull that data and let me know the key words that Amazon was saying that I should be putting my product in front of. And then I’ll take those out of that campaign and I’ll create another campaign and that will be like a manual campaign. And then now I can start to build on those keywords, and there’s a whole bunch of other strategies we really don’t have time to go into, but really just finding the low hanging fruit for the keywords, not just the obvious, not just the stainless steel garlic press. Like we want little key words or little keywords that you might only get one sale a month on, those are the ones that I like to go after. Steve: What do you say your CPC is in the very beginning? Steve: Yeah, the auto campaign yeah totally. Scott: I just looked at it the other day and it was like my ACOS which is average cost of sale, and usually you want that below 50. And I think I looked the other day it was like 32%. And that’s ongoing since like gosh like last like November, all right? Steve: Let’s talk about that so if you wanted ad below 50 that implies that you are not really going to be making a profit right, or just breaking even? Scott: That’s not 100% true. I look at it like 50% or under. 50% will mean that you spent that you spent the money — basically you got 50% back of what you spend in. So depending on how much margin you have in there. So in my case and here is I guess really important part of this is, I don’t care if I’m not making my full profit that I had spent, that’s not where the magic happens, okay? That’s great in all that you are making sales from that, but what I really want is I want to get the acknowledgement, and I guess the credit from Amazon that I sold through these keywords. Because now that I sold through these keywords, I’m going to start ranking organically for these keywords, does that make sense? Scott: Because, I’ll just give you an example, and I kind of use this on one my workshops where I basically show that I spent one month $1300 on pay per click, and I generated 110 sales from that pay per click. But I generated 1500 sales organically. And part of the reason is because I’m ranking for these keywords that I was advertising for. So even if– if I want to rank for stainless steel garlic press, I don’t even care if I lose a little bit of money on that campaign. If I can get 20 sales for that, then I can possibly or start ranking for stainless steel garlic press when someone searches in the organic search. And that’s going surpass any money that I would spend over here. Steve: So how did you come to that conclusion, meaning like how did you know that there’s a strong correlation between that and your organic rankings? Scott: Because I could see that I was ranking. I could see one day I wasn’t ranking, I wasn’t getting any sales like other than the pay per click, and then all of a sudden I started ranking for all of these keywords that I was paying for. Steve: So do you do anything else to rank your keywords like outside like drive outside traffic to any Amazon listing based on their keyword? Scott: No, I don’t do that at this point, I don’t really recommend it at this point until you’ve exhausted pay per click, which I think you are going to have to find it really hard to exhaust it. Because you can just — you can scrape keywords from your competitors. You can go in there and just Google planner and just get 800 keywords that are related to your product by punching in your URL for your Amazon listing, and then it will give you 800 suggested keywords. Even though they are not Amazon keywords, they are still keywords that people have searched for outside of Amazon. And then I will take those, I will plug them into an Amazon pay per click campaign, and I will do the same thing, I will do 70 cents per click, $25 ad budget, I’ll let the data tell me what it does. Steve: Okay, and just to be clear do you actually have an outside website right now, or are you just doing everything on Amazon? Scott: Everything is mostly on Amazon; I do have an external site just to deliver like free videos, some guides, a place that actually is a company kind of in a sense, so it’s not just by itself. And I do plan on eventually hiring out some content creators to create and build up that content to start getting some SEO traffic through that, through Google. But I mean Amazon gives you the matrix, they give that you just got to click on this keyword and you sold through this keyword. So it gives you that data which is beautiful, so I can see my conversion rate, I can see what I’m doing, and I can tell you right now and I think you would agree that there’s no traffic that’s going to convert higher than inside of Amazon. Scott: So if you are going to take outside traffic, even Google AdWords, if you are going to take that traffic and drive it over to an Amazon listing, you are not going to convert the same as if you would inside. Now you may convert better from Google to your website, yeah, I do believe that. But I wouldn’t — I personally wouldn’t spend the time doing the outside traffic to your listing, when you can be doing so much more inside of your Amazon pay per click. Steve: So right now, so what it sounds like is, are you primarily just doing the Amazon pay per click stuff? Are you doing anything else to drive sales? Scott: The only other thing that I do in the beginning is I’ll run like a small little mini blast. And I did that through, there’s a site — you can do a 30 day free trial tomason.com, I don’t if you’ve heard of that? Steve: That is actually really good, yeah. Steve: Okay I don’t know about that service actually. Scott: Yeah, I have used that one and it works pretty good. The thing is though with all these here is the deal, it’s like, it’s a list of people that signed up that want to receive a free product, and basically from that they are going to give you an honest review. So it’s really all the people who are dealing with services that are coming up like — they are coming up all over places, people are out there, they are building a list of VIP people that want to review Amazon products. And they are not just sending it out there in email so that you can go ahead and start getting your codes taken, so people buy them. And that’s really natural, you can build your own list, if you want to build your own list and I have done that too. I’ll take Facebook ads drive it to a Facebook fan page of mine, and tell them that they can get a stainless steel garlic press for a dollar 95 while supplies last. And then I get their email address for the code, and then boom I got an email list of people that are interested in garlic presses, and other kitchen goods. Steve: So when do you actually let the list ride? Steve: Meaning like you stop trying to solicit a lot more reviews through this like giveaways and that sort of thing. Scott: Honestly, I really only do like one maybe two. Scott: Because I’m not going after the high competitive supplement business let’s say right? I’m not going after the ones that you have to do that all the time. If you want to go after a product that’s doing 100 units a day for the most part, a lot of other people are going to be trying to go after that same product, so you are going to have to do these blasts probably one a month. Steve: Really, okay, for the supplement guys? Scott: Oh, gosh, yeah, and any other thing that’s that competitive, and you’ll tell right away with all the reviews right? And that’s why if you are going after a products that have a thousand reviews, these people are doing actively trying to do this. And then you are always going to have to start try to stay and keep up with those people, that’s why I go the other way. I’m going after the products that no one else wants to do, because it’s only sold 10 or 15 units a day, right? They are not as attractive right? But to me it’s easier because all I got to do is blast once if I even want to, and then just start running my pay per click, and then go to the next. And really just refine the pay per click, because the pay per click, I mean you can spend months just continually adding new keywords and you are going to just be blown away at what you are finding. It’s kind of like you are out there sifting the dirt and the finding the golden nuggets. Steve: Yeah, it sounds like Google AdWords in a way. Scott: So much easier though. Steve: Yeah, it is actually. Scott: There’s really– you don’t have to worry about ad copy; you don’t have to worry about any of this. You just say I want to advertise these key words to my listing yes, go how much? $25 a day spend, 75 cents per click, go. Steve: I mean you don’t even need to do anything, you can just let Amazon do everything to it, and it still works pretty well. Scott: It does, it absolutely does, and I would strongly recommend anyone that’s listening to definitely if you are at that stage to definitely use the Amazon pay per click. It totally will be the money well spent, because again every sale you get through a keyword, you are sending a signal to Amazon that they could possibly be ranking you for that key word, every single time. So the more you can go through that keyword, that’s why I said if you want to rank for a keyword go ahead and spend 100 bucks to get sales through that keyword. That’s going to be 100 bucks that’s going to then help you rank yourself organically in getting on the first page, and then the sales are going to come naturally. Steve: So I want to take kind of segue back to where you left off with the product bundling and all your strategies, I just want to take a couple of minutes to talk about some of those things. Scott: Sure absolutely. Yeah, what do you want me to go into? Steve: I don’t remember where we left, I should have — yeah. Scott: Yeah, there’s no problem, well I’ll just tell you what I like about them, the bundling like some people will be like, yeah I found this really cool product, but it’s only 9.95. I’m like it’s fine if you can bundle that. So if you can find one that’s 9.95, but then you know that it could come in a three pack, and then it could come in a five pack, well then you are going to have to create three different packages, and then it would just be three separate skews. But the cool thing about that is it’s kind of like the leader to get people in the store where if people are scanning and they see yours is 9.95 to 29.95, you are going to get more clicks because they see the 9.95. Once they get into their listing you are going to see that I can buy one for 9.95, I can buy a three pack 19.95, and I can a five pack for 29.95. So automatically the three pack is a great deal. So now you are going to start selling a lot of the three packs, but the one pack you still make a couple of bucks, but three packs or the five pack is really where you are going to make the money. So I love that strategy, it works really well, I have got a body of mine that’s doing it now, and definitely he out sells the one pack all the time, because of the three pack and the value. It’s kind of like a no brainer, it’s like I’m going to get one for free kind of thing. So that’s the one thing I like about bundling, and then the variations it’s a similar approach, but it also allows you to reach people with different things that they want within the one product. It’s kind of like a size thing in a sense, or a color right? So you might get someone that likes red, green, and blue, but then they also might want all three. So you could do each one separate price, and then you could do a bundle for all three. So this one here you are able to reach four different people potentially, or four different customers in a sense. And that’s why I like variations, because it does also give you like that umbrella, so all of your reviews will come under the one listing. So either if you just sold one of the red and then you sold ten of the blue, and you got reviews on the blue, you are still going to get — your red one is still going to get credit, because the entire listing is going to get all those reviews. Scott how do I make my product different? Add an accessory, not an eBook, I mean eBook you can add that too if you want, but everybody is doing that. Add a physical book if you want, but add something that has value that you know that they are searching for as well that can go and compliment that product. And preferably try to find something that not everyone else is finding on Alibaba, because then it’s going to make it harder for someone to just go to Alibaba and find the two products, do the same thing. Scott: So bundling and finding accessories to me is an edge that a lot of people don’t want to do the work to do, but I think it could benefit you so much more. Steve: So you have your agent person that you use now to source your products, but if you were to start over today would you just go straight on Alibaba again or? Steve: So for all the listeners who actually want to give this a try, what would you say is like a good timeframe from inception to getting like your first sale? Scott: Well, I would say realistically after you get through the research stage, the research stage is going to probably be the most time, and probably the most frustrating in the beginning, I’ll be honest. But I would say if you gave yourself like 45 days would be my guess. Like 30 days is really pushing it, I mean I think you can do it if you went AliExpress model. But if you went the other model and you kind of got all of your eggs kind of lined up in a row, your docks in a row, then you would go ahead and say — I would say 45 days would be a good — 60 days at the most. I think for sure, but I want people to know too, this isn’t something that you just — you put something up and all of a sudden you immediately get sales, it’s not like that either, it’s not like get rich quick. Steve: It’s funny, because that was my experience when I went on Amazon. Steve: We just threw up some products, and we just made six grand in a month without even really soliciting them any reviews. Scott: But did you have the inventory? Scott: Yeah, you are coming at it from a different angle, because you already had inventory, you already went to the research stage, you already got this. So if you already got a product, and you want to put it up, I think you can have sales in like a week or less. Steve: Yeah, or like the first day. Scott: Oh, absolutely yeah, no I’m talking about the whole process. Steve: Okay, got it, got you. Scott: Yeah, now if you already got a store front, and you are selling on ecommerce, you are crazy now, you can just start putting product up on Amazon. I mean to me that’s — it’s like a whole another channel that you could be tapping into, and in a sense it’s like you don’t have to fulfill the orders really, you just got to send in the inventory. So if you are talking like that yes, Steve I mean you can do this like you said, as soon as the product lands in FBA, and it’s available, you can make a sale totally. Steve: In fact it’s like almost too easy, I feel — so I’m just curious how this is going to play maybe in a couple years once — because people are just going on Alibaba and just throwing stuff on Amazon and it’s selling. But at some point it might reach some saturation point, but in the meantime it’s great. Scott: Yeah, it totally is and I think that you are right though, it’s going to come to a point where you are going to have to be a little bit more creative. I think Amazon is also going to — I think they are going to support the brands that have better round a little bit, that’s why seller feedback to me is very important, and a lot of people don’t look at seller feedback as being important. I look at that as kind of like your domain name, it’s your authority site in a sense. And the more feedbacks that you can get on that that are good and this is for your entire sellers account, I believe that that’s going to give you a lot more drive, a lot more push once you launch other products. So if you are coming new on the scene and you are brand new, you got a brand new sellers account, and you are trying to sell a stainless steel garlic press, and I’m someone that’s been on here for a year and I have got 1000 feedbacks on my listing, and I have got three other products selling, and I put a new product, my product will rank quicker than yours. Steve: So you think that has to do with seller’s rank, right? Steve: Is it, do you know for sure or is that? Scott: I don’t know for sure, I don’t think we’ll ever know for sure on any of this stuff. Anything with Google, anything with Amazon, it’s just everyone that I have talked to that has been around even bigger brands, I mean brands that are doing 100K a month and more, they’ve all said that their process is really simple when they launch a new product, it’s really just list the product and just run a little bit of pay per click starting, and then once it starts it goes. And that’s what we believe is because of that history. And it just makes sense to me, why would Amazon have seller feedback if they didn’t give you any credit for it. Steve: Yes, so it’s like domain strength in Google land in ranking, yeah. Scott: Totally, it’s like an edge domain or links pointing to a domain, right? It’s the same the same concept, and again it’s like I mean if you have a website that’s ten years older, you got one that you just bought. And you start putting content on the one that’s older, that one probably going to rank a little bit better because it’s got the age to it. Scott: I mean again we can’t prove any of the stuff, but it’s good theory. Steve: Yeah, it’s just like Google stuff too I mean yeah. Scott: It’s kind of common sense in a sense, so that’s how I look at it. Steve: Scott we’ve been chatting for a while, and I’m sure the listeners want to know more, and so where can they find you? I know you have an awesome podcast which I recommend; it’s called the amazing seller. Scott: Yeah, just find me there I would say is the podcast, I have got a ton of episodes and I really do break everything down, I share my story step by step and all of that stuff. And I really — I don’t hold anything back, and again it’s a show that’s just like yours, it’s just me being me and kind of — I share some guest view on it, and actually it has an [inaudible] [00:59:05] as of now, but it will be soon, but yeah. And then I have a free workshop that I do, I do that — right now I’m doing one every about every seven to ten days. And it’s really just walking through the five phases that I have used in the beginning, and kind of like I teach now. So it’s totally free, it’s at the amazingseller.com/workshop. And anybody is definitely welcome to join that, I do live Q&A at the end of those as well, so yeah, that’s pretty much it. Steve: Awesome, hey thanks a lot for coming on the Scott, I learned a couple of things myself, and you are clearly very knowledgeable on this topic. Scott: Well, I appreciate you having me Steve, I really do appreciate and you know what, I learned something too, I learned something about wire transfers today. So I will bring that over to my audience. Steve: All right, right on Scott. Scott: All right man, take care. Steve: Hope you enjoyed that episode, selling on Amazon is the real deal, and guys like Scott Voelker are killing it online. So if you are interested in ecommerce, now is the time to give Amazon a try before the market place becomes saturated with sellers. For more information about this episode go to mywifequitherjob.com/episode88, and if you enjoyed this episode, please go to iTunes and leave me a review. It is by far the best way to support the show and please tell your friends, because the greatest compliment that you can give me is to write a referral to someone else, either in person or to share it on the web. Now if you are interested in starting your own online ecommerce business, be sure to sign up for my free six day mini course where I show you how my wife and I managed to make over 100K in profit in our first year of business. Go to mywifequitherjob.com, sign up right there on the front page, and I’ll send you the mini course immediately. Once again I also want to thank Bigcommerce for sponsoring this episode. Bigcommerce is one of the best shopping carts that I recommend if you want to start your own online store without having to worry about anything technical. So everything from design, to sourcing, to payment processing, is all built in, and all you got to do is populate it with the products that you want to sell, and you can literally start your online store in matter of hours. Simply go to Bigcommerce.com/mywifequitherjob, sign up and you’ll instantly receive one month free. Once again the URL is bigcommerce.com/mywifequitherjob. I also want to thank HostGator for sponsoring this episode. HostGator is one of the best web hosts out there that I recommend if you want to start a blog. And in fact I hosted mywifequitherjob.com on there in the very beginning and loved it. You get 24/7 live support via chat, phone, and email. You can install WordPress in just a single click, and they’ve got an easy to use website builder and design services, and the best part is that I’m offering a 30% discount for all podcast listeners. So please go to HostGator.com/mywifequit to redeem the discount, once again that’s HostGator.com/my wife quit. Thanks for listening. great podcast, very actionable steps. Thanks! Always enjoy listening to your podcasts. Great work! Scott mentions in this podcast a free tool that gives you a history of BSR, and pricing on Amazon products. Your transcript shows the link is kemokemokemo.com, but can you confirm that this is the correct spelling? I can’t seem to find it.